My husband and I are both fans of anything taco, so when I shared this treat with him he was ecstatic. It starts out like any good taco-making session should: brown up some ground beef and mix with a little water and taco seasoning. Then it takes a turn for the awesome by combining onions, tomatoes, and mushrooms with the taco meat before wrapping it in crescent rolls and baking it in the oven. 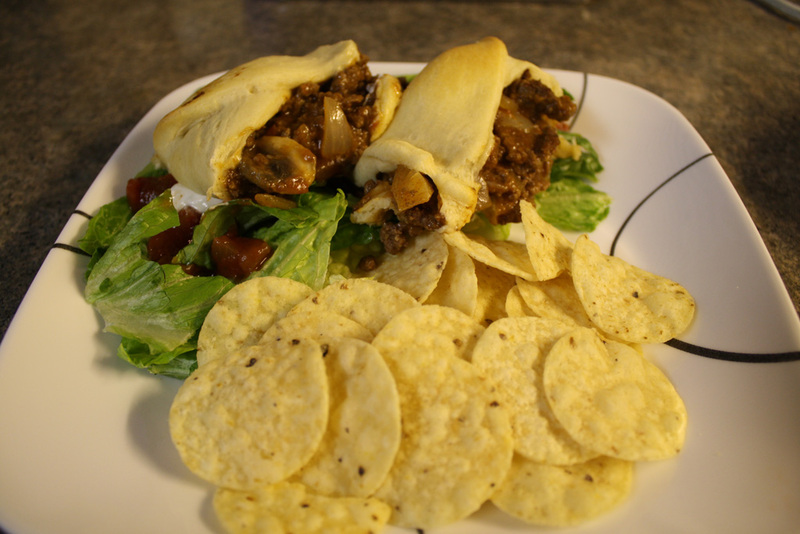 There is nothing quite like biting into this flaky taco braid meal! Chop the onion. 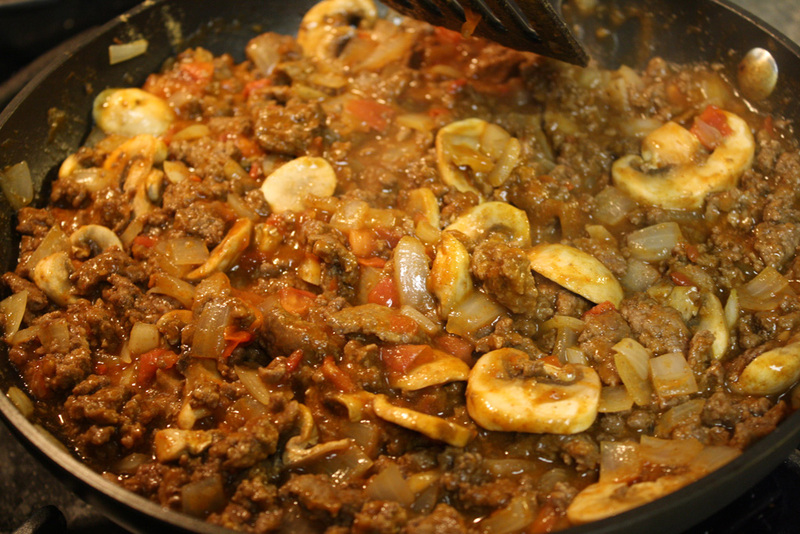 Place onion and ground beef into a large frying pan. Cook on medium-high heat until meat is browned. Drain grease if needed. 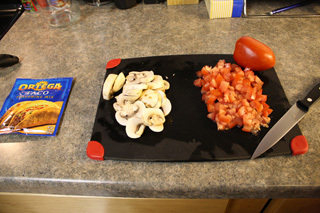 Add mushrooms, tomatoes, package of taco seasoning, and water to meat mixture. 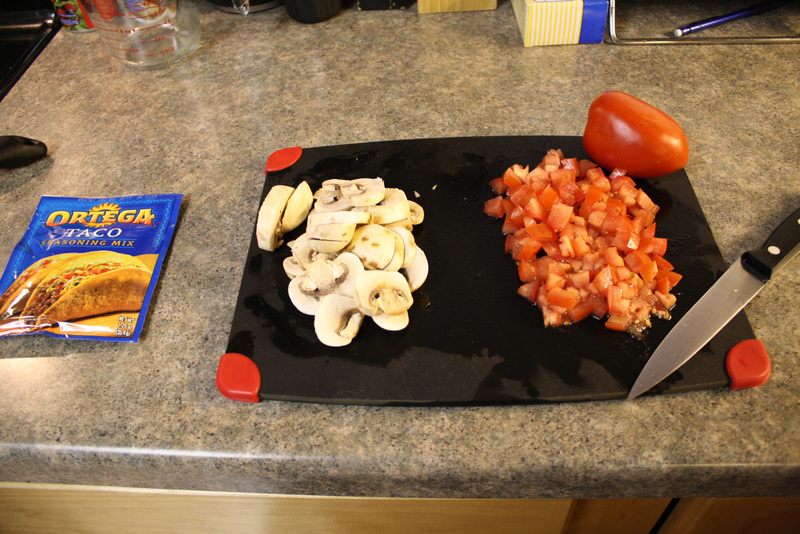 Cook for an additional 2-5 minutes, or until water is mostly cooked off. Meanwhile, lay the crescent rolls flat on a large cookie sheet. Roll or pinch the seams so that no juices will run onto the pan. 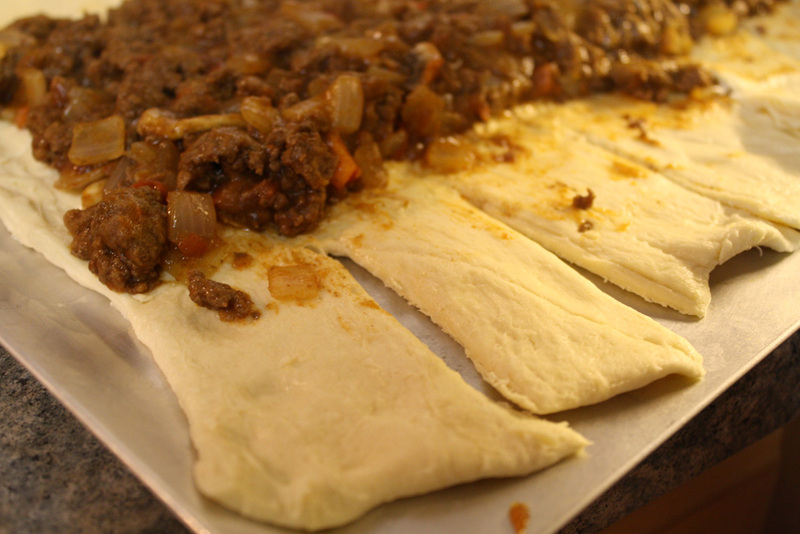 Then place the meat mixture on the middle third of the crescent rolls. 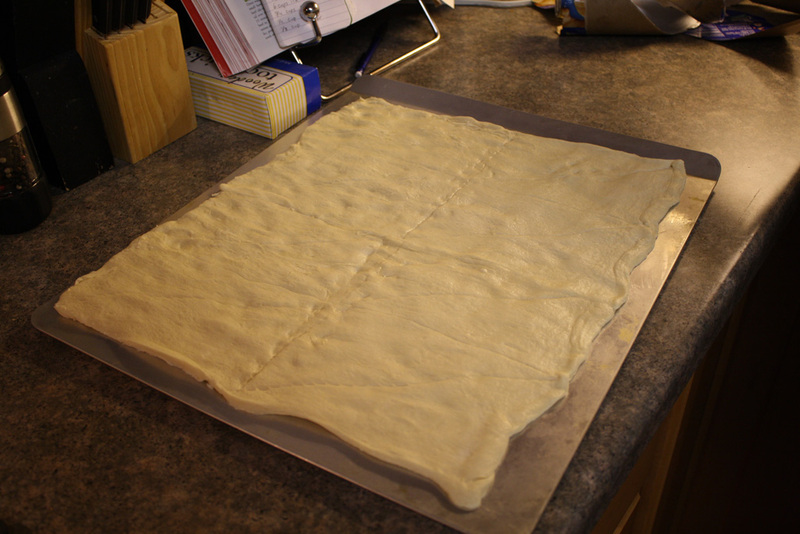 Cut 1/3 of the way to the center of the crescent roll sheet every two inches or so on both sides of the meat. Starting from one end and working to the other, pull the opposing sides of the crescent roll over the meat, turning the sides so as to form a nice braid, and pinch at the center. 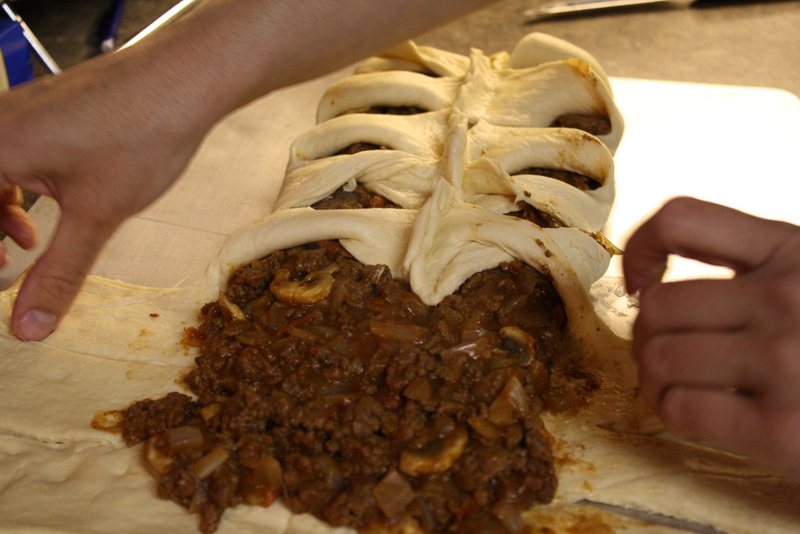 When fully braided, place the pan in the oven for 12-18 minutes, or until the taco braid turns golden brown. Cut into eighths and place on a plate. Top with sour cream and serve with salad, taco chips, and salsa. This delicious meal will fill you up and makes for great leftovers! Tip: you can make taco braid omelets with the leftovers! Just scramble an egg, heat a small frying pan with butter, and start cooking your egg. Cut a taco braid piece into one inch squares and place on half of the frying pan with cooking egg. Top with cheddar cheese and fold the remaining half of the egg over the taco braid. Serve with Top the Tater or sour cream. It's an amazing, yet filling breakfast that will have you coming back for more!